We always make two pies on Thanksgiving. Usually, apple and pumpkin, or bourbon-pecan and pumpkin. For the pumpkin, I use Libby’s tried-and-true recipe; it’s easy and always turns out well. For the pecan, I use my own favorite recipe for Double-Shot-of-Bourbon Pecan Pie; this one is also easy (you just need one bowl!) and is absolutely insanely good. For the apple, I use my great-grandmother’s recipe. What pies are you planning to enjoy this Thanksgiving? Will there be two? If you’re hankering for a taste of both, feel free to use my dad’s line … I’m sure he won’t mind! Preheat oven to 425°. Peel and slice apples (slices should be thin, but need not be uniform). If you have a food processor, use the slicing blade to speed up the process. Place apple slices in a large bowl. Add lemon juice, brown sugar, cinnamon, nutmeg and flour; using your hands, toss until all slices are fairly evenly coated. Cover edges of pie crust with a pie shield or ring of foil (to keep the crust from overbrowning). Bake at 425 degrees for 20 minutes on a rack in set in the middle of the oven. Remove pie shield and/or foil. Reduce heat to 375 degrees and bake for 30 more minutes. Remove pie from oven and sprinkle with sugar. 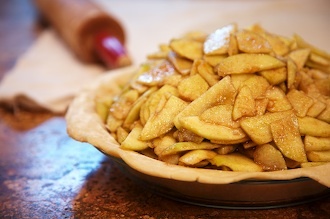 Return to oven and bake for 10 more minutes or until apples are tender when a toothpick is inserted through one of the slits. What wonderful memories you have. Thank you for sharing them. My mother-in-law makes an amazing pumpkin pie, and this year my mother made a to-die-for apple pie. And I, like your father, had to have both! You dont use any thickener? Where can I find ‘cookie cutters’ like this lovely snowflake? Thanks for all of the ideas that make pies look as good as they taste!!!! Hi! I’m sorry for the delayed reply — just seeing this. I got mine on Amazon.com. Michael’s craft store also sells them in the winter. Hm, have never tried that! If you try it let me know how it turns out!